Brisingr, by Christopher Paolini, Doubleday, 760 pages, Rs600. Christopher Paolini is back—with a bang. With 550,000 copies sold in the first 24 hours of its launch, Brisingr has to qualify as a bang. In a Harry Potter-less world, Paolini’s book was expected to make that kind of noise. 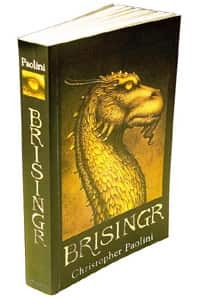 But Brisingr, the third book in Paolini’s Inheritance Cycle (following Eragon and Eldest) is a bit of a disappointment. First, it is over a year late. Second, the author has stretched what could have been shorter, and probably a better read. Brisingr starts with Eragon, Saphira and Roran at the gates of the enemy, the Razac, who had murdered Eragon’s uncle Garrow and kidnapped Roran’s fiancée Katrina. Eragon has to repay a debt. Garrow and his wife had brought Eragon up on their farm and Roran is his cousin. And it goes on and on and on—battles interspersed with endless moral debates. To go back to books one and two, Eragon is a rare breed of warrior in the land of Alagaesia. He is part of the Dragon Riders, a band created to stop the elves and dwarves from fighting amongst themselves. Galbatorix was one such Dragon Rider. After years of peace, a group called Urgals kill Galbatorix’s dragon and the incensed rider goes mad with grief. With the help of a few cruel disciples, Galbatorix drives a wedge between the inhabitants of Alagaesia and declares himself king. All ends well as Eragon and Saphira go to Ellesmera, where Eragon makes a startling discovery about who his real father is. He learns what makes Galbatorix tick and how to counter him. Eragon gets himself a new sword that he names Brisingr. He comes back to the Varden (a group led by Queen Nasuada that is dedicated to overthrowing Galbatorix). The Varden, in the meanwhile, have laid siege to the city of Feinster. Paolini runs out of space here and promises that Instalment 4 will be an exciting finale. What started out as the Inheritance trilogy has become the Inheritance Cycle. The next book, promises the author, will be the last. Paolini has often been compared to J.K. Rowling and Philip Pullman—but I’d hardly use the names in the same breath.